It is a unique medical diagnostic equipment invented and diagnosed by IT Corporation. Logotype of Accuniq is a representative symbol that becomes a core element of visual communication of Accuniq. Logotype of the ACCUNIQ was developed to ensure the unity of the visual image and requires special attention to its use as it is intended to create a sense of unity to the members and to deliver a consistent image of the ACCUNIQ internally and externally. When applying, one must comply with the provisions and principles for the prevention of any damage of image resulting from distortion, deformation and abuse. Signature is a combination of the symbol mark and logo type of ACCUNIQ. As signature of Accuniq is a representative symbol being a core element of visual communication of Accuniq, it should be used carefully when it comes to the forms and colors. When applying, one must comply with the provisions and principles for the prevention of any damage of image resulting from distortion, deformation and abuse. 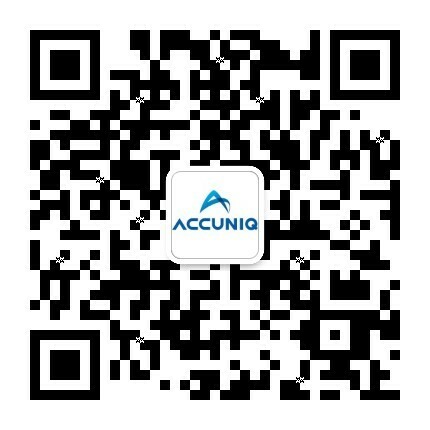 As the color scheme is an important means to differentiate ACCUNIQ, it is important to be accurately and consistently used by the specified color. Spot colors should be used in principle, and it can be printed as a spot or 4 color process depending on the representation of media (newspapers, magazines, packages, etc.). In particular, when following the four color process, the difference in brightness, saturation etc. could be severe. Therefore, obtain the best standard colors by comparing with the standard color samples. Using the RGB mode may result in a color difference depending on the applying medium, hence, use after adjusting to the provided color as a standard one.